The Garden Route is one of South Africa’s most beautiful and exciting regions. 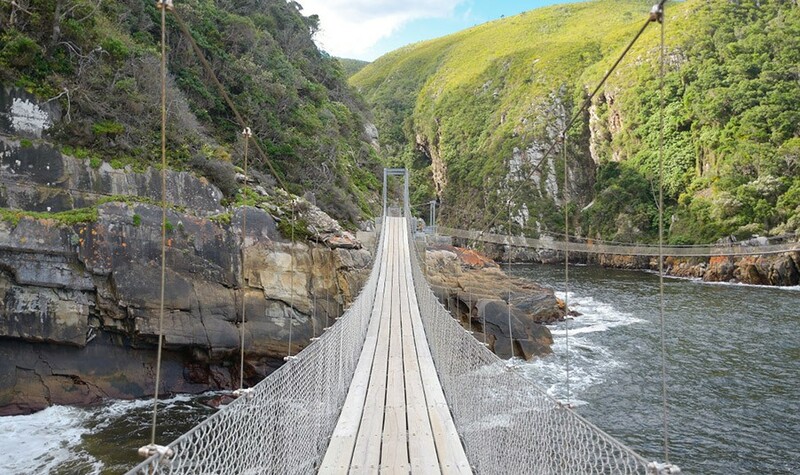 With a list of outdoor activities and extreme sports to make any dare devil envious, the Garden Route has become popular in recent years not only for its incredible charms and beauty but for the activities that it offers. Garden Route tours enable tourists to see the beautiful views and quaint towns of the Garden Route, and take guests to the most exciting hot spots for an adrenaline rush. Here are our top reasons why you should embark on adventure packed Garden Route tours. • As the Garden Route takes guests up the east coast of South Africa – from Cape Town to Port Elizabeth – visitors almost constantly have a view of the sea. Here, the Indian Ocean Sea is warm, and entices surfers with its formidable waves on windy days. Tourists are offered boat trips where they can whale watch or go fishing; waterskiing, tubing, and kite surfing are also popular amongst water babies. The most popular adventure sport here however, is shark cage diving. Many tourists travel along the Garden Route with this activity in mind, whilst others make last minute decisions to participate in the adrenaline packed activity; regardless, you can be sure to have the time of your life and enjoy a thrill like no other. Diving and scuba diving are also popular activities along the coast of the Garden Route. • Majestic mountain ranges are scattered along the Garden Route and offer an endless variety of outdoor activities for locals and guests to participate in. From hiking, mountain biking and scenic walks to abseiling, caving, and paragliding, the Garden Route offers every possible mountain adventure you could be looking for. Garden Route tours offer guests the chance to feel exhilarated from these activities and to be inspired by the beautiful views the can enjoy whilst on the mountain. • Whilst travelling the Garden Route, guests can stop by exciting and unique wildlife sanctuaries and game reserves. The Knysna Elephant Park allows guests to participate in feeding the elephants and even go for elephant rides. Monkey Land and Birds of Eden allow guests to come up close and personal with the most cheerful and serene wildlife in South Africa, and the Oudschoorn Zoo showcases South Africa’s big cats, crocodiles and smaller animals. Private game reserves can be found along the route, however many Garden Route tours choose to take their guests to the Addo Elephant Park which lies an hour outside of Port Elizabeth; this park is the second largest game reserve in South Africa and is a world famous elephant sanctuary. • Other extreme sports that can be found along the Garden Route include skydiving and bunji jumping. Book a head for a trip on a microlight and go for a fun breakfast run by hiring a motorcycle for the morning. If you’re looking for an adrenaline rush whilst you’re on one of the Garden Route tours, you can be sure to find one. The Garden Route is a popular destination amongst tourists; it is beautiful and there is never a dull moment. If you’ve been craving an outdoor adventure or are in search of an adrenaline rush, you’ve come to the right place; the Garden Route will offer you the vacation of a life time; packed with fun, fresh air and excitement.